Next time you get angry or frustrated, don’t focus on your circumstances. Ask yourself what belief about the circumstances you are clinging to. And think about how that might be incorrect or not useful. Everyone sees things from their own lens… you may want to try to reframe and learn EFT Emotional Freedom Techniques, tapping to release the old beliefs fully. 1. Choose a belief to release and write it. You may want to consider: What was its old purpose? Who in your life used to say it, or imply it? What made their statements true for you at that time? How has that “truth” affected your life? Just be sure to stay present, looking at your old belief with compassion for yourself. 2. Challenge your belief! Write down, and take time to acknowledge, all the life experiences that you have had that actually PROVE your old belief is not true. This may be in the form of compliments that you have received, promotions at work, loving relationships, etc. 3. Identify your desired outcome. Write down all your desired outcomes relating to replacing the old belief. Choose one outcome that most powerfully represents who you would be if you had that outcome. 4. Ask yourself: “What am I willing to do to make these changes?” You can always get ideas and reinforcement from professional guidance and support in one-on-one sessions or group programs. You really don’t have to go it alone in your life, and the belief that “you should” is in itself a disempowering belief! 5. 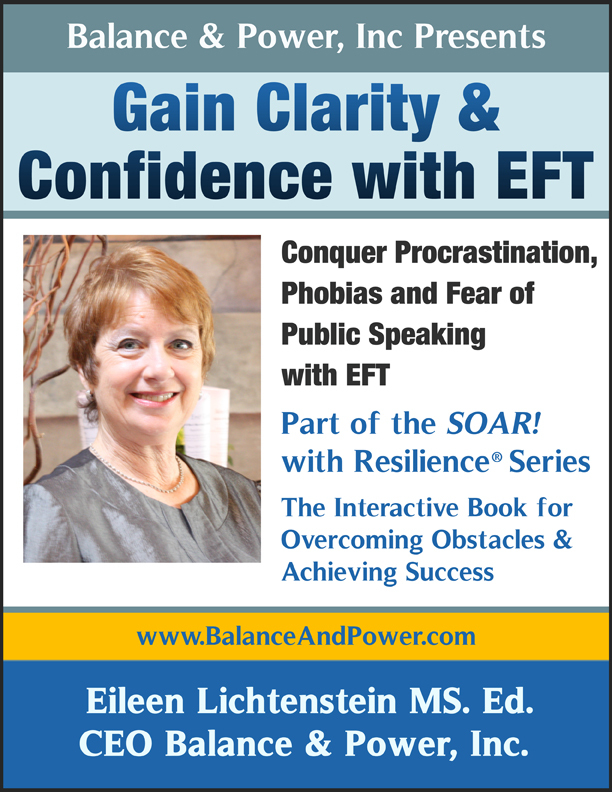 Learn EFT and “tap on it”. Love, respect yourself and believe you deserve…and the challenges will actually help you learn and grow, not wear you down. Remember, you are lovable, capable and worthwhile. You are enough! 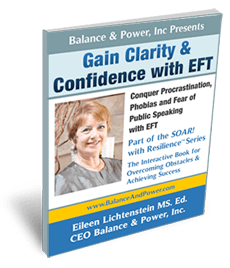 Receive FREE EFT eBook At the seminar! My clients and workshop participants love this ’cause it works. It’s important to know that this is a very temporary interruption-release of a stress/frustration/anger path you may be on and that you will need to pursue further strategies and techniques for long term change of patterns that may have been established for years. On the count of three inhale and “punch” the ceiling with both hands. Exhale and release both hands to your sides. When punching you may visualize a person-people-circumstance on the ceiling. You’ll be feeling (temporarily) good and may be smiling too :)- ready to rock ‘n’ roll! This sequence is a modified section of the “progressive muscle relaxation”. 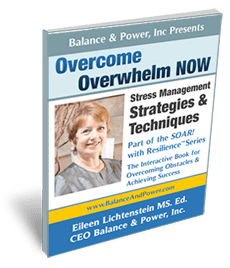 Stress is cumulative so any interruption of it changes your physiology to a healthier and more easily manageable state of mind-body and well being. Release, Relax & Recharge Throughout Each Day for Optimal Happiness & Well Being! Stress is cumulative. Extreme frustration and stress left to fester can easily lead to inappropriate outbursts of anger violent or depressive episodes on the other side of a continuum. When you are feeling stressed, overwhelmed, unappreciated, angry it’s important to take time out to release, relax and recharge. When you are experiencing difficulty meeting multiple job responsibilities and target dates, juggling personal and business responsibilities and having relationship challenges it’s important to take time throughout each day to recharge. The suggestions below will have positive effects on your happiness and wellbeing. Breathe Deeply – Take 3 cleansing breaths by inhaling deeply through the nose, belly rising. Sustain the inhalation, then exhale (through mouth, belly deflating), making the exhalation forceful and sustained, like a sigh. This temporarily changes your physiology and can be the beginning of a sustained relaxation. Walk – A five-minute walk can begin to shift your mood; walking for a longer time has additional benefits! Connect With Nature – A great stress reducer! Listen to Music – It can definitely be a mood changer! Say No – Don’t overextend yourself! Take a ‘Joybreak’ – Do something different that you enjoy such as reading a magazine, calling a friend, writing a thank-you note, stepping outdoors! De-Clutter – Decrease ‘visual noise’! Allow Time – Performance has variables and interruptions are inevitable! Think Positive – Let go of self-sabotaging language and worry! Smile and Laugh – Proven to ease anxiety and reduce stress! Foster Forgiveness of Self and Others – Create inner peace by regularly practicing a loving-kindness meditation. Activities that release and relax give you energy and vitality. Stress often builds up in our bodies and minds, leaving us feeling worn down or overly sensitive to stimuli. Do you want to feel more positive and energized? Find activities that you like to do- outdoors if possible that include exercise and breathwork. I love Zumba, a dance-exercise modality and always feel fanastic after taking a class. A walk on the beach, kayaking in calm waters or bicycling on the Long Beach, Long Island boardwalk are also activities I enjoy that release and relax and give me energy and vitality. Actively releasing stress from our bodies through physical activity or breath work immediately makes us feel calmer and more in control. Using the power of our minds to focus on more positive thoughts will begin to infuse us with energy and vitality, and we benefit by feeling stronger, more balanced, and ready to engage in our normal activities again. Spend time releasing tension from your body and mind , and give yourself the gift of energy and vitality. EFT works on my cat! I’ve been feline challenged the last few weeks after we brought an 8 month old “rescue cat” Butterscotch home to reside with our 3 year old Suki- who is a “special needs” cat I’m sure..we thought it could “perk” him up. even staying there when I my coaching clients sit on it! So we devised a “screen door” with a latch for B to stay at night in my office with all his stuff while Suki took care of his food needs etc and had the rest of the house to himself. Day by day Suki is getting used to B, but still hissing. Today, while they were lying dopwn within ia few feet of each other, I sat on the floor and EFT’d S. Wow~ he totally calmed down and then trancelike fell asleep. placing him on my lap at the computer & the desk looking out the window. B’s been in & out and Suki is sleeping on my desk. Amen! I want them to be in peaceful coexistence for all of us- and-so that I’ll feel comfortable going away for the weekend with Steve in a few weeks- and to Europe end of September. My neighbor will be stopping in- I think I’ll teach her EFT in case there’s a problem..